Nicknamed ‘The Last Emperor’, Russian Mixed Martial Artist, judoku and sambist Fedor Emelianenko has won championship titles in several combat sports. He has been described by many, including Chuck Norris and Mike Tyson, as ‘The greatest mixed martial artist of all time’. Who is Fedor Emelianenko, how old is he, when is his birthday, how tall is he, where is he from and what is his background? Fedor Emelianenko is trained in mixed martial arts, sambist and judoku with a long and prolific career. He’s 41 years old and stands at 1.82 metres tall. He was born in Rubizhne, Ukraine, in the former Soviet Union on September 28 1976 to Olga, a teacher and Vladimir, a welder. He was raised with his three siblings, two of whom are now also fighters. After leaving school, Emelianenko spent two years in the Russian Army tank division as a firefighter, before embarking on his MMA career. Why is Fedor Emelianenko famous and what is his occupation? Emelianenko is famous as a MMA fighter, who is known for his aggressive technique, as well as his all-round mastery of all aspects of MMA. He has twice been an Olympic torch bearer, for the 2008 summer Olympics and the 2014 winter Olympics. Along with his highly successful sporting career, he co-owns a MMA competition organisation and is president of the Russian MMA union. He has also branched out into politics, working at Russia’s Council of Physical Fitness & Sports, and as Belgorod Regional Duma. Emelianenko occasionally appears in TV shows, movies and games as himself. What is Fedor Emelianenko’s net worth? World’s Top Most have estimated in 2017 that Emelianenko is one of the highest paid MMA fighters in the world, with a net worth of $16.5million. How much does Fedor Emelianenko earn? Forbes has listed Fedor Emelianenko as 37th in the list of top celebrity earners for 2016, with estimated earnings of $2milion in the year up to June 2017. How much does Fedor Emelianenko weigh? Emelianenko weighed in as a fighter at 235 pounds, or 107kg, putting him in the heavyweight fighting division. Who beat Fedor Emelianenko, how strong is Fedor Emelianenko? Fedor Emelianenko’s first defeat was by Tsuyoshi Kohsaka, and caused some controversy when the doctor stopped the bout after just 17 seconds due to Emelianenko sustaining a head wound. Dan Henderson beat Emelianenko in July 2011 after knocking him out and continuing to land blows, causing the referee to stop the fight. Fox TV show Sports Science tested Emelianenko’s strength in 2009, using a dummy with sensors to measure the pounds of pressure applied during his choke. The force was recorded at 500 lbs, the exact same amount as could be produced by an Alaskan Brown bear and 12 times more force than produced by a python constricting its prey. Who has Fedor Emelianenko fought, how many fights has he won, what are his most famous fights? Emelianenko’s many opponents include Egidijus Valavicius, Heath Herring, Mirko Cro Cop and Mark Hunt. 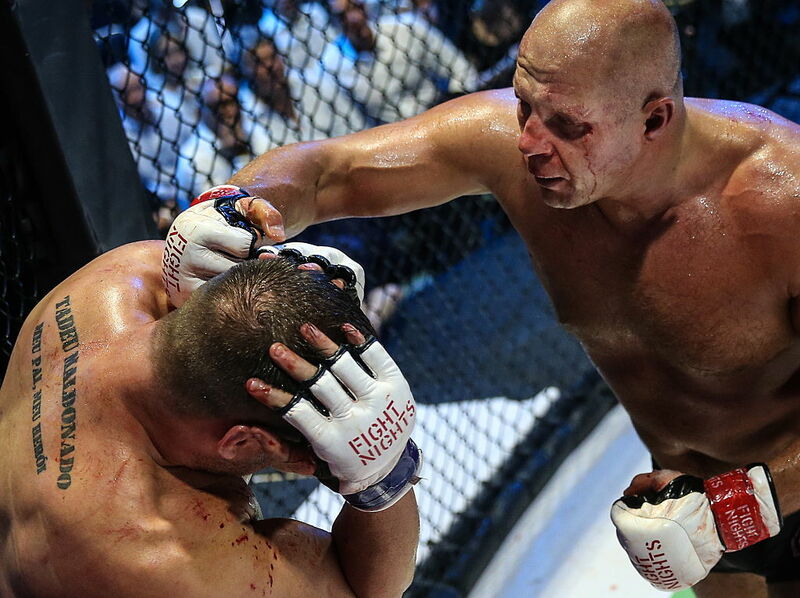 Of his 42 fights, Fedor Emelianenko has won 36. One of his most notable fights was against Croatian Mirko Filipovic. The hype and build-up for his fight against the kickboxer lasted almost two years before they finally met and Filipovic succumbed to Emelianenko’s superior strength. In competition, he has won 16 medals while representing Russia. Where does Fedor Emelianenko train? Fedor Emilianenko trains with Red Devil Sports Club, and has done so since 2003. What happened to Fedor Emelianenko, has he retired? Although he retired on June 21, 2012, Emelianenko came out of retirement to return to competitive fighting on July 14 2015.
Who is Fedor Emelianenko fighting next, when is his next fight, where is he fighting next? His next fight is lined up for April 2018 against former UFC heavyweight champion Frank Mir. The location has not yet been finalised. Does Fedor Emelianenko have any children? Fedor Emilianenko has three children; Masha, born in 1999, Vasilisa, born in 2007, and Elizaveta, born in 2011. Is Fedor Emelianenko married, who has he dated in the past, was he married? Emelianenko married his first wife, Oksana in 1999, having met her at school. They divorced in 2006. He went on to marry long-term girlfriend Marina in 2009 before divorcing her in 2013. In 2014, Emelianenko remarried his first wife Oksana.